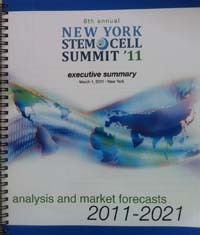 Robin Young’s 6th annual Stem Cell Summit was held on March 1, 2011 in NYC. In attendance were scores of public and private stem cell companies. Presentations included: 21 adult stem cell companies, 3 embryonic companies, 7 device/ instrumentation companies, and a panel of medical experts discussing Spinal Cord Injury. Each company gave a 10-15 minute presentation. For the past few years, Arnold Caplan, Ph.D, a leader in the world of stem cell therapy, has presented the keynote address to the conference. Dr. Caplan is professor of biology at Case Western and has authored more than 300 publications. Not only is he well known in academic circles, but he is no stranger to the biotech financial community, as he was the founder of Osiris Therapeutics (Nasdaq: OSIR), a publicly traded cell therapy company. According to his own disclosures, Dr. Caplan no longer has financial ties with Osiris, but he is involved with other cell therapy start ups. Here are some highlights from Caplan’s keynote entitled, The State of MSC’s in 2011. He emphasized that the first phase of the cell therapy revolution has been focused on tissue engineering, whose main premise is using manufacturing processes to make stem cells differentiate into various lineages like bone, heart, or brain. However, Dr. Caplan proposed that the next phase of the Cell Therapy Movement, known as Regenerative Medicine, will come from natural healing responses from the stem cell, not from the actual differentiation of stem cells into various cell lineages. adipose tissue is an enormously potent source of autologous regenerative therapy. More specifically, the REGEN revolution will come from your body’s own natural healing response which occurs when stem cells mechanically separate from blood vessels and release therapeutic molecules that your body takes cues from. Caplan stated that therapeutic uses would come from both cultured and uncultured stem cell sources, and cited uncultured adipose tissue as a potent source of autologous regenerative therapy. What are Mescenchymal Cells (MSC’s)? Mechencymal stem cells, also known as MSC’s, are specific cells within a population of stem cells with certain surface markers. These “MSC’s are the cells that are doing all the business of healing”. Dr. Caplan described how Mesenchymal cell population is largely a function of the number of blood vessels. MSC stem cells in their native state, resting within the wall of blood vessels. The natural niche of mesenchymal cells is within the blood vessel wall. Thus, the more blood vessels, the more MSC’s–and vice versa. In the scientific community, this thesis is largely expressed as: All MSC’s are pericytes. Recent publications by Dr. Caplan have been devoted to this theme of how all MSC’s are pericytes and helps one understand why stem cells provide vascularity to damaged tissue. In simplified terms–they are a source of vascularity or blood supply. How do you activate MSC’s? MSC’s are attached to the blood vessels. According to Dr. Caplan, the healing mesenchymal cells activate when they become detached from the blood vessel wall. This can occur with mechanical force, chemical force, or signaling mechanisms. In previous blog posts, we have described some mechanical conditions where MSC’s become activated as they detach from the blood vessel wall. What is magical about MSC activation? When MSC’s detach from the blood vessel wall they release a TON of cytokines and growth factors that, in essence, become a personalized drug store for your own body. What this means is that Big Pharma may need to rethink how they are doing things and get onboard the REGEN train. Adipose fat has 300-500 fold more stem cells compared to bone marrow. In a moment of jest, he referred to “the arrogance of those working with bone marrow.” Caplan explained that “as it turns out, the winner of MSC population is adipose tissue” explaining that per ml, adipose fat tissue has 300-500 fold number of healing mesenchymal stem cells compared to bone marrow. Adipose tissue can be derived from liposuctioned fat. He also detailed that a concentrated pellet of uncultured fat tissue, known as the stromal vascular fraction (SVF) of adipose tissue, is an ‘enormously potent source of autologous stem cell therapy’. When the body doesn’t respond to antibiotics, a condition called sepsis can occur. This condition causes the body to shut down and often results in loss of peripheral limbs, shock, or even death. Dr. Caplan cited a recent publication which discovered the ability of MSC’s to kill gram positive and gram negative bacteria. If this plays out therapeutically, it would mean MSC’s could cure sepsis! Considering Dr. Caplan’s history, this promises to be a very interesting era for medicine and health care! We welcome your comments about this fantastic new era of regenerative medicine. would like to find out added blogposts shortly. I did wound care for many years, and was the co-director at the Greater Baltimore Medical Center Wound Care Clinic. Our focus now is on stem cell research. I know you are located here in Maryland, and we would love to talk to you about using your GMP facilities for cultured MSC research. We pray everyday for progress, as our family has been struck by this scourge. In the meantime, I do what I can with stem cell research. Such giant steps are made through research!! Wonderful things are discovered. Hopefully – more great results will be helpful in managing cancer therapy. Thank you for the information. The “book” we mention in our blogpost is a handout from a conference. It is not for sale anywhere. Just go to your local Barnes and Noble or Borders bookstore, there are many books on stem cells. You can also go tho the National Institute of Health Stem Cell website for more a lot of great info and illustrations. It is true that the volume of peer reviewed publications and research papers attesting to fat as an abundant source of stem cells has seen a tremendous increase in the past years. even in plastic surgery, where fat tissues need to be cultivate and reused. Stem cell research is the future of the medical industry. As much as the media might frown upon stem cell research it helps save lives. Thanks for pointing this out to us. We do forget that a lot of people do not know the two big divisions of stem cells: 1) embryonic 2) adult stem cells. We appreciate you taking your time to remind us. As you know, adipose tissue and bone marrow are NOT derived from embryos or aborted fetuses. Both of these sources are referred to as ‘adult’ stem cells and come from living humans. With stem cells, there are two divisions and you can really draw a line in the sand between the two camps. Stem cells extracted from fetuses. Besides the terrible moral and ethical issues that go with this, these stem cells are extremely hard to control. In the science world this is referred to as ‘undifferentiated stem cells.’ This means that these embryonic stem cells can turn in to ANYTHING they want. The literature if FULL of instances where these embryonic stem cells turn into teratomas. Although great knowledge has been gained, I agree that is not a good thing on so many levels. These are stem cells that are extracted from living human beings. They are found in many tissues and organs, such as adipose tissue, bone marrow, cord blood, heart, brain, etc. Besides not having any moral issues, these cells are a lot more controllable because they are already partially defined down a pathway. Thousands of clinical trials have taken place with NO evidence of any safety issues. Therefore, this general category of stem cells, adult stem cells, is the wave of the future. It is safer, easier, and more effective. You can be sure that the first therapeutic therapies will come from adult stem cells. This article above was explaining that WITHIN the adult stem cell world, adipose tissue is the most prolific source of the healing stem cells, called mesenchymal cells. Bone marrow has gotten all the attention over the past few decades, but as it turns out, your own unwanted fat is an amazing reservoir of healing stem cells! It’s a beautiful thing. Therefore, this is a happy time for medicine and for using cells from our own body, instead of manufactured drugs, to cure diseases. This is a turning point for medicine. The adult stem cell therapy world is referred to as REGENerative medicine. If this were Internet time, we would be in 1992. I have posted an abbreviated version of this post to Yahoo buzz. THANK YOU! It bothers me how stem cell research has become so politicized. You never hear any of the good stuff like this, it’s all half truths and agenda driven sound bytes, so people think that stem cell research means killing babies and that sort of thing. Well definitely, these articles keep getting better. Keep us up to date, I am happy to see that we are all on the same road. CONGRATULATIONS.